The Sportline Duo 1060 packs several fitness functions into one device. You can record your heart rate two ways — continuously by wearing the chest strap, or on demand by using the finger pulse monitor without the chest strap. It's also a pedometer watch, counting your steps and estimating distance and speed. 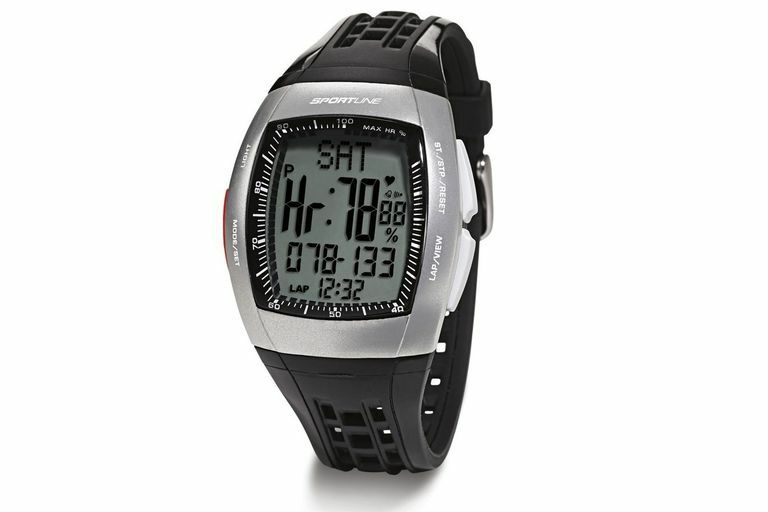 It is a full-featured sports watch with timer, stopwatch, interval training, and alarms. It also works well as a watch, with a night light. Doesn't upload data to your computer or sync with a mobile app. Not an all-day pedometer, is used only on demand. The Holy Grail is to get one device that does it all. Fitness walkers and runners are a step closer with the Sportline Duo 1060. It is a pedometer, speedometer, heart rate monitor, stopwatch, and wristwatch combined. You can record your heart rate two ways — with a finger pulse monitor on the face of the watch, or by wearing the chest strap sensor that transmits continuously to the watch. No foot pods or other items needed — you can just put on the watch and the optional chest strap and you are ready to rock. The pedometer function is used only during workouts rather than recording total daily steps. You turn it on and off when recording a workout. The step count agreed well with my other trusted waistband pedometers. The pedometer function also displays your speed (in miles per hour), distance, calories burned and fat burned. Monitoring your heart rate is a great way to tell whether you are working out at the correct level. I liked the convenience of using the finger pulse monitor and didn't have any difficulty in getting a reading that I trusted. The chest strap sensor worked perfectly to transmit constant data to the watch. You can set four heart rate zones, with alarms for being over or under the target zone. Heart rate is displayed three ways: beats per minute, percent of maximum heart rate, and on an Intellitrack display. After your workout, you can see time above, below and in the target zone. Within the exercise/heart rate mode, you can record lap times. It also has an interval training mode with up to 30 intervals with as many as three phases per interval, each with a user-definable heart rate target zone. You can review heart rate and pedometer data for the intervals. It took me a few uses to get the hang of switching between functions, turning on and off the exercise timer and reviewing the history. The instruction booklet is helpful. My old eyes wished for better contrast on the watch display. I didn't find all of the functions to be intuitive and I had to continue to rely on the instruction book. Who Is the Sportline 1060 Right For? The bottom line is that I found the Sportline Duo 1060 to be an excellent pedometer/heart rate monitor watch for walkers and runners. It is so packed with features that you won't need any other devices to enhance your workouts. That said, it doesn't sync with a mobile app or your computer, so all of the data it shows you are gone after the 7-day memory has expired. If you have a smartphone, you have better options for heart rate monitors and fitness trackers that will sync and save your data. But if you prefer a device that doesn't require a smartphone or computer, this may be the right one for you.